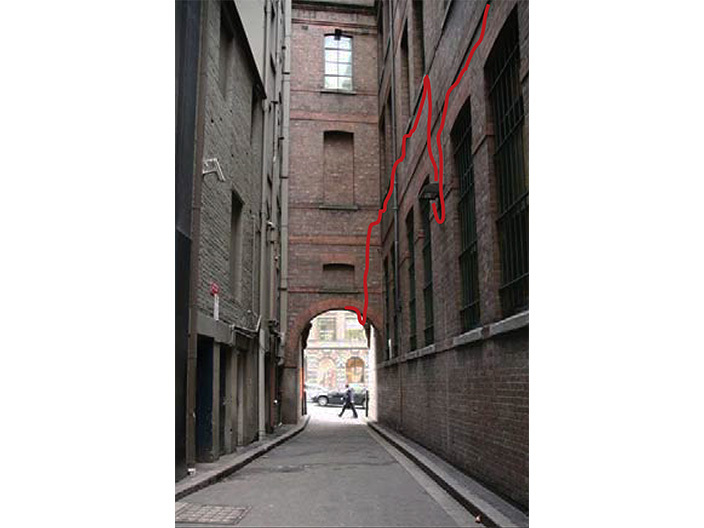 It starts with a loose end – a red rope snaking into Bridge Lane from Bridge Street. It teasingly invites passersby to follow and discover an unknown space, to unravel the thread of the urban fabric and see where it leads. 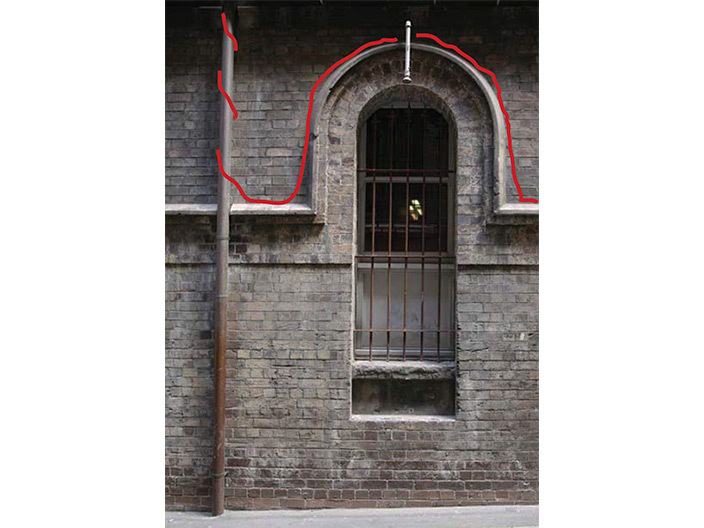 As it meanders the length of the laneway, the rope frames details on the walls – a vent, a No Stopping sign, patterns in the masonry or scars on the brickwork – highlighting what is everyday, or over- looked, as something striking and unique. The rope is also signifier of things hidden, an interpretation of the pipes, wires and conduits which run invisibly through the city. Through it, we’re reminded that so much of what sustains our city remains unseen. At the intersection of Tank Stream Way, it connects to a network of ropes arching over the lane’s entrance. 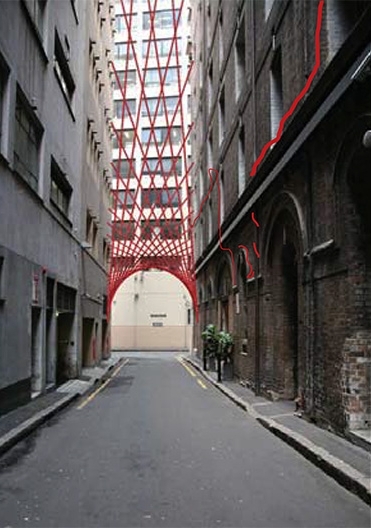 This temporary gateway mirrors the arch at the Bridge Street entrance, enhancing the verticality of the narrow space and drawing the gaze up to offer a new perspective on Bridge Lane. Echoing the spiders’ webs that characterise neglected, forgotten spaces, the arch- way captures the attention – and hopefully the imagination – of those who encounter it. Sunlit during the day and illuminated at night, the shadows it throws down will form their own shifting designs. Ultimately, the rope is a metaphor for community: a vast network that begins with a single strand. The Project Team came together with a shared interest in the way urban spaces can create a sense of community and connection – to the past, to the future and to those around us. Despite our diverse perspectives as architects, an artist and a writer, our focus was the powerful ability of both art and architecture to engage and inspire. Our collaborative approach began with exploring the different ideas informed by our varied professional experiences, then refining them with a common goal. The project design crystallised after we researched materials, site history and the utilisation of public spaces in Australia and internationally. Bridge Lane and Tank Stream Way were vital to colonial Sydney, but two centuries later their uniqueness and significance are easily overlooked. We aim to encourage pedestrians to take another look at what’s around them, to see their surroundings with fresh eyes and find joy in un- expected discoveries. When a place is valued, then its future is assured. 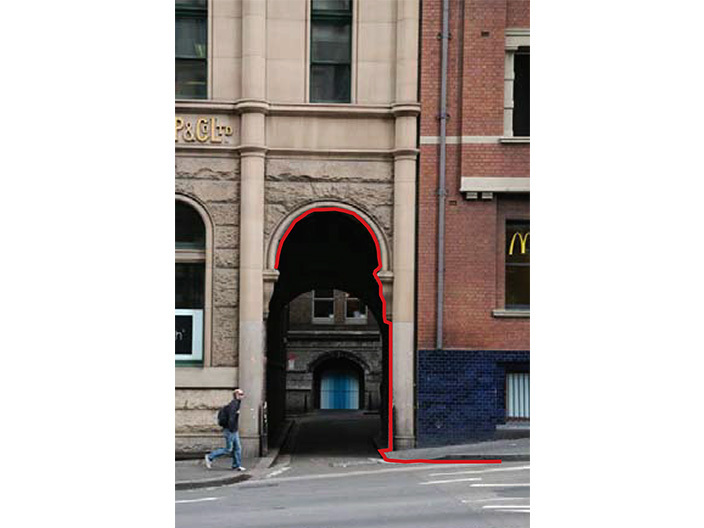 Our artwork will encompass the length of the laneway from the sandstone archway at Bridge Street to its termination at Tank Stream Way. 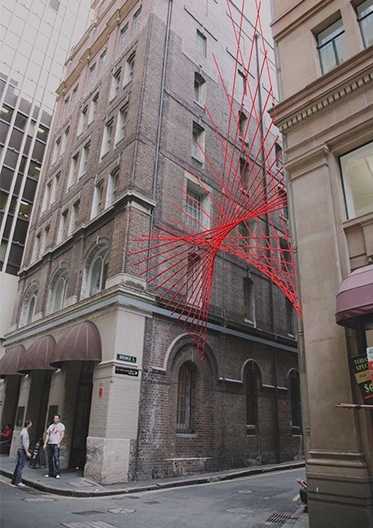 The ropework will meander along the laneway, trac- ing a highlight over various interesting features. At certain points it will be attached to the wall and pavement with mechanical pin fixings. The rope work will culminate in a figurative archway, drawn taut and anchored to the opposing facades of the laneway, and designed so as to minimise the number of fixing points on the facades. 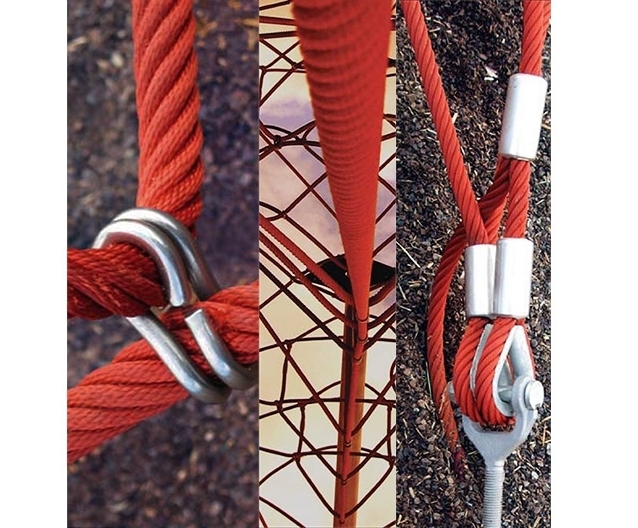 The rope work will be tied together with a combination of knots, lanyards, turnbuckles or tie plates.